Can you tell us about the history of the market here in Erbil? The idea of establishing a capital market here in Erbil is an old one. It goes back to year 2007 when prime minister of Iraqi Kurdistan region Nechirvan Barzani mandated us to study the possibility of establishing another market in Iraq besides Iraq Stock Exchange. Following these directions, many meetings and conferences were held with the presence of Iraq Stock Exchange and the head of Iraqi Securities Commission. 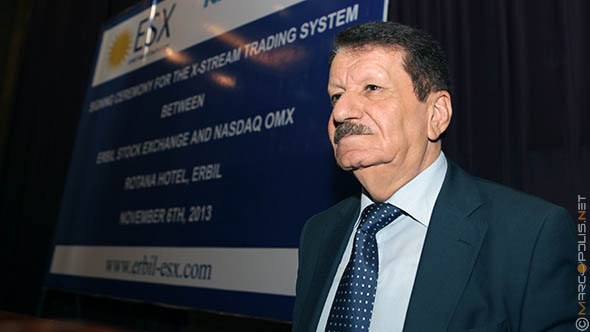 A conclusion was reached implying that it is possible to establish another market besides Iraq Stock Exchange, in Erbil. A committee was formed to study this matter and it included 10 members headed by me. 3 of them were counselors at the presidency of the cabinet. There were also the representatives or general managers of the Central Bank in Erbil and Sulaimaniyah, representatives of the chambers of commerce in Iraqi Kurdistan―Erbil, Duhok and Sulaimaniyah,―a counselor of the Minister of Trade and another of the Minister of Planning. 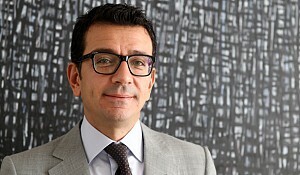 The idea was studied and a conclusion was reached indicating that it is possible to establish another market besides Iraq Stock Exchange following the examples in other countries like Dubai and Abu Dhabi. A committee was formed and the idea was proposed to the businesses in Iraqi Kurdistan where a lot of reputable companies became stakeholders. A joint stock company was established to be Erbil Stock Exchange, and so it was based on a joint stock company with 10 billion Iraqi Dinars, about $8 million. The company was established and it had its Board of Directors, and I represent the presidency of the board. We started business and following the directions of the economic committee of Iraqi Kurdistan, we used consultancy services from Louis Berger Group since it worked in a lot of countries all over the world in this area, including its work with Iraq Stock Exchange. An agreement was reached and they have been working with us for 6 months now. 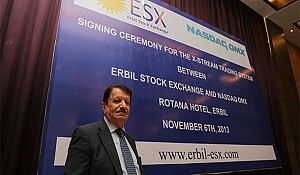 It shall continue to provide consultancy to Erbil Stock Exchange for one year and a half more. Since we needed a system to work through, we made a deal with Nasdaq Omex to provide us with a one. Nasdaq Omex is an internationally known company and it has about 25 markets in many countries and it has also provided systems to more than 70 countries. So, we reached an agreement with Nasdaq Omex to provide us with a system to work through like the other international markets and since it is an advanced system, it should facilitate the operation of stock selling and buying whether to local or international companies. We are moving on with the process and with the help of international companies like Louis Berger and Nasdaq Omex, we hope it will be ready for work by the mid of next year. Will Erbil Stock Exchange be open to international companies to come or is it only for Iraqi companies? The new agreement signed today related to the system provided by Nasdaq Omex will definitely facilitate companies participation whether they were local or foreign companies of those enlisted on Iraq Stock Exchange. All companies in Iraq, not only those in Erbil or other parts of Iraqi Kurdistan, will have the opportunity to be enlisted on Erbil Stock Exchange. Are there any privileges to foreign companies investing in the local market of Erbil on tax level? Iraqi Kurdistan Investment law no.4 of 2006, which is known to everybody, gives many privileges that can rarely be found in any of the neighboring countries' laws. One of these privileges is that an entity that gets a license to operate as an investment company will be exempted from income tax for 10 years. Also, materials used in the project will be exempted from customs duties. In addition to that, the profits can be transferred outside Iraq, and they may use any kind of workforce whether local or foreign according to the expertise required. If project was approved by the higher committee headed by the prime minister, to be a strategic project, the land will be owned by the investing company. You can also see that the first article of this law indicates that a foreign worker shall be treated like a citizen. There are many more privileges, but these are the most prominent ones. What kind of companies do you think will be operating and enlisted in Erbil? What areas do they cover? Is it real estate, banking or what? 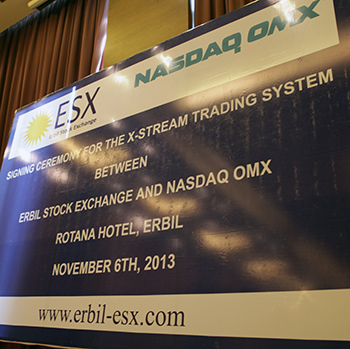 Erbil Stock Exchange reached an agreement with Nasdaq Omex to provide us with a system to work through like the other international markets and since it is an advanced system, it should facilitate the operation of stock selling and buying whether to local or international companies. There are many reasons for the establishment of the market in Erbil. One of these reasons is that people save big amounts of their money at home because of what happened during the past regime time when banks' managements were withdrawn from Iraqi Kurdistan taking people money with them, so a lot of people today don't trust banks enough to deposit their money at. Now, instead of depositing money at the banks, people can buy stocks of companies they think to be profitable and become stakeholders. Peoples' money will be used in business this way. Another reason is that there are more than 18,000 companies, 2,000 of which are foreign, operating in Iraqi Kurdistan. Most of these companies are either limited or family businesses. We would like to invite them to change into Joint Stock Company so that people can get the opportunity to participate and be part of these companies to defend them in the future. Another thing is that we are trying to open the door to foreign investments through this market. We thank God for the stable security and safety in Iraqi Kurdistan, but still, foreigners look at the situation in Iraq as a whole and avoid making investments on their own. We hope the existence of the market will create an entry point for them and if they ever felt like security is deteriorating, it will be an exit point as well. So, when the government announces the establishment of a joint stock company whether related to industry, agriculture or tourism they may enter. Also, citizens may buy stocks of the companies known locally like telecom companies. Again, it will be an entry point for foreign investors to be partners. So, these are the most important reasons for the establishment of the market as well as many others but there is no room to be mentioned here. Are there any taxes levied on profits made by the citizens of Iraqi Kurdistan when investing in the market? I still have no information in this regard, but taxes are levied from companies themselves. People already pay an income tax and companies pay a tax of no more than 15%, so companies will participate in the market and not individuals and tax will be levied from companies including those holding stocks or participating in Erbil Stock Exchange. If I invested here, bought stocks and its price increased, will there be a tax levied on investors' profits? It is possible. Though I don't think there may be, but since we didn't start work yet, I can't tell for sure. However, Iraq Stock Exchange is working and I don't think they levy taxes on the realized profits. On the other hand, companies may post losses instead of profits, so I believe tax accounting will be conducted by referring to the annual balance based on the profits made throughout the year by the end of it. At the American market we do have taxes levied from companies, but what about people? 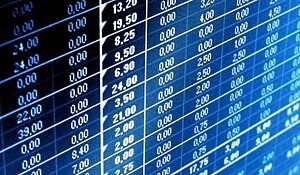 Do you levy taxes from people when their stocks post profits? It is possible, but we are still not sure and neither we nor the tax authority has a definite idea of how things will be determined and whether there will be taxes imposed on people making profits from their stocks through the market. 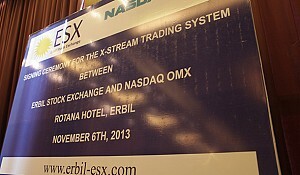 Can you tell us about the relationship between Erbil Stock Exchange and NASDAQ in general? Before talking about the relationship between Erbil Stock Exchange and NASDAQ, I'll talk about that between Erbil Stock Exchange and Iraq Stock Exchange. 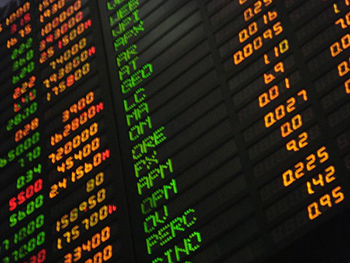 We communicate and hold meetings with Iraq Stock Exchange permanently. We are trying to have one independent deposit center together. Iraq Stock Exchange already has one but it is owned by it, and thus we are trying to establish an independent center to be owned by both parties. 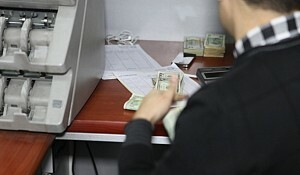 If there will be other markets in the future, they can also be partners in this deposit center. We operate according to Iraqi law and regulations, Law no.74 for stock exchange approved by ISC. Also, the head of ISC maintains a good relationship with us and he's always present in our meetings at the Iraq Stock Exchange, and so he will be at Erbil Stock Exchange. As for our relationship with Nasdaq OMEX, it is a technical one. We have just agreed on the provision of the system to Erbil Stock Exchange today. Hopefully, the system will be provided according to the contract in period ranges from 6-8 months. Also, the contract includes the training of ESX staff, provision of the staff, and maintenance of the system for 5 years. What else besides the stocks to be enlisted in the market? Will there be securities, ETFs and indices? At the beginning, it will be limited to stocks selling and buying. Securities are one of the options we hope to work on whether they are state securities like those issued by certain ministries or others. We hope the market will deal with goods like gold and oil. The development will be gradual, and as we succeed in one area, we'll move to another. Can you tell us about your ambitions for the future? We have a big hope that Erbil Stock Exchange will be promising and successful in the area taking into account the rapid progress and the development witnessed by Erbil and specially Iraqi Kurdistan after the fall of the regime on 2003. Investments on the other hand are increasing in Iraqi Kurdistan where we can find about 2,000 foreign companies. There is also a progress in conference organization area, and I'm the supervisor of Erbil International Fair. You can see that we hold about 10 – 15 international fairs specialized in different areas. There were more than 625 companies from 27 different countries participating in the last fair that was dedicated to construction and electricity. There were 12 European and 5 Arab countries besides the neighbor countries like Turkey and Iran, South West Asia countries like India, Pakistan and Malaysia, in addition to USA, China and Canada. There were also countries participating for the first time like Armenia and Vietnam. This is an evidence on the progress achieved in Iraqi Kurdistan and the current investments. It's worth mentioning that there are over 20 foreign companies working in oil exploration. Iraqi Kurdistan is rich in natural resources and minerals, and it has about 18% of the budget of Iraq, like you see, Iraq's budget is increasing year after year and Iraqi Kurdistan's budget, represented by three governorates, increases accordingly. The economic growth in Iraqi Kurdistan is very fast and it shall cover all areas especially construction. I believe the companies to participate in the market shall cover all fields and we specially hope that oil companies operating in Iraqi Kurdistan will do since their existence is essential for the success of Erbil Stock Exchange.